A few steps from the clock tower arch is our most treasured Monastery, which is my favorite area for peace and quiet. During the long hot summer days, I often can be found in the cloisters of the Dominican Monastery. A true hidden gem which is often missed by travelers who never venture off the Stradun, it’s hardly ever crowded; a perfect place to sit among the fragrant lemon trees nestled among the blooming bougainvillea. 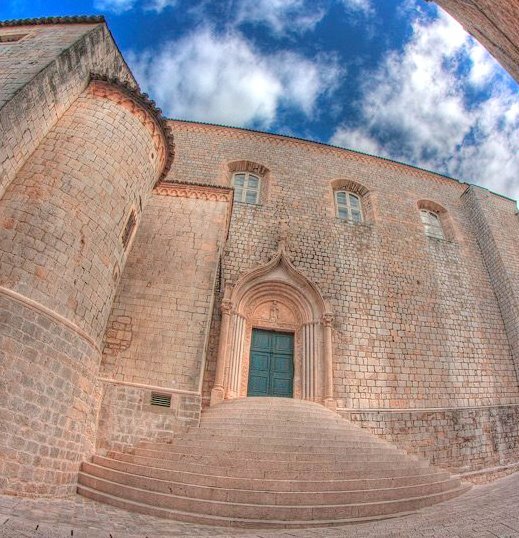 The Dominicans established the monastery in 1225 and the existing structure was completed in the 14th Century. The strategic site was a sensitive position for the defense of the town and the entire complex was encompassed within the city wall, protected by Fort Revelin. The grand stairway with its stone balustrades were filled with mortar by the monks to avoid viewing the ankles of the town’s ladies. The southern entrance steps were recently replaced with a circular layout conforming to the original 14th Century design. The cloisters were completed in the 15th Century. 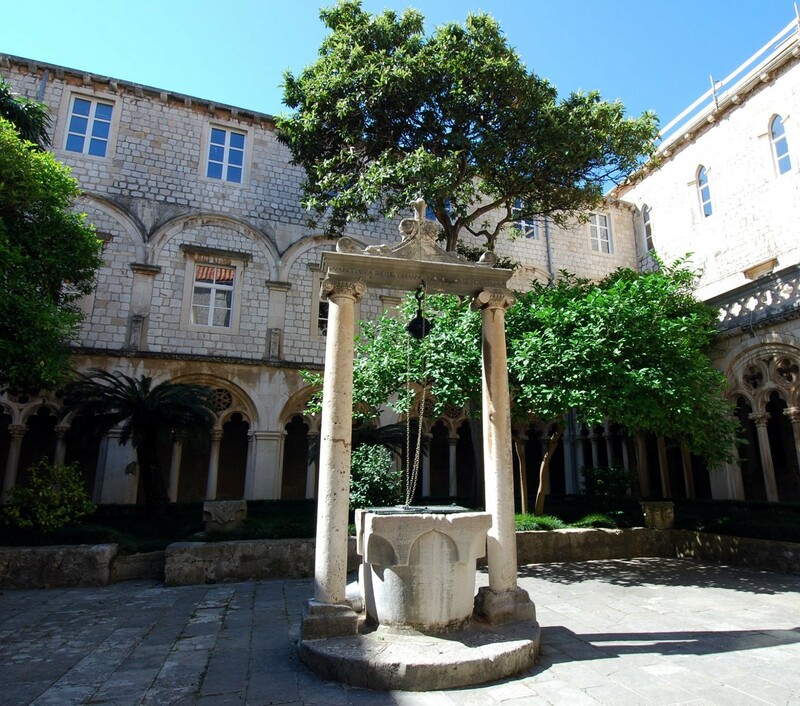 The middle of the courtyard is our richly decorated stone cistern, surrounded by lush vegetation providing a refreshing feeling much like a summer breeze. The old stone well is still in use today. During the 1991 Homeland War it was the only source of clean water for the town locals. The interior is of simple architectural design. The high outer walls, bare of ornaments, are rich in stone furniture. 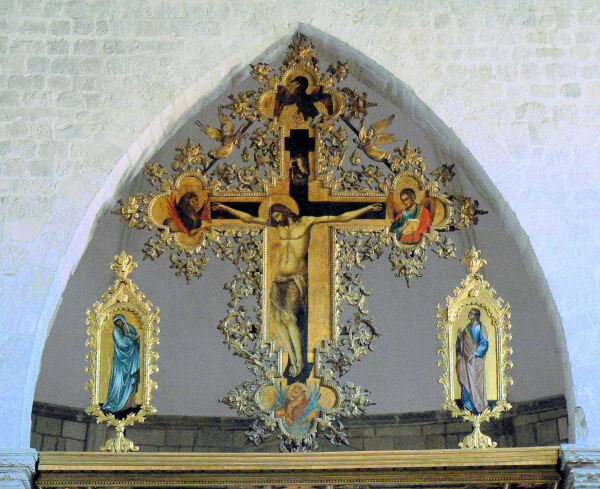 The most impressive piece, a work of Paolo Veneziano from the 14th Century, is the large golden crucifix in the central arch above the main altar. 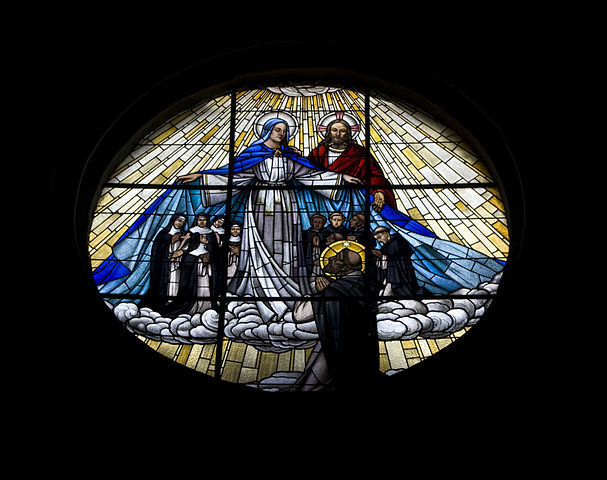 The original wooden beam ceiling, destroyed during the Homeland War, has been replaced with the same style as was the magnificent stain glass window. During our summer festival the monastery is often the venue for concerts. Guests enjoy an unforgettable experience with the exceptional acoustics and ambiance of this magnificent church. 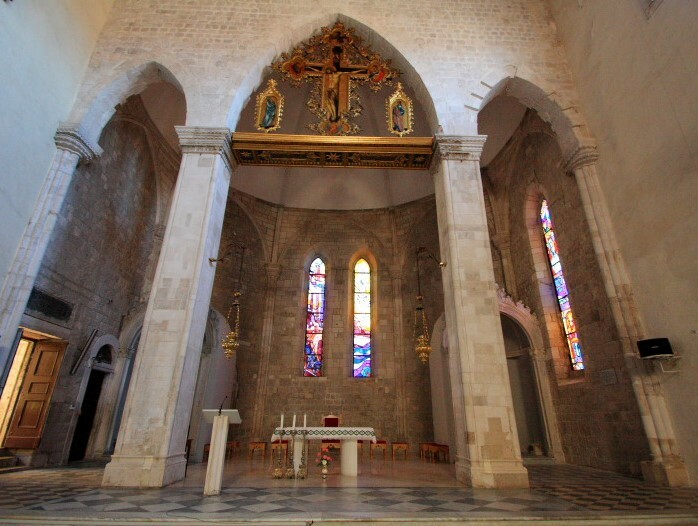 This entry was posted in Cultural and Historical Sites, Lifestyle, Pearl of the Adriatic, Recommendations and tagged Croatia, Dominican Monestary, Dubrovnik, European travel, Hidden gems, Private guide, Unique tours by Cavtatlady. Bookmark the permalink. Sounds like a beautiful place. Thank you for your comment, the Dominican is very special. I wish I had gone there. Yes, too bad you missed a hidden gem. Perhaps another trip someday. Thank you Ina, I am honored to be a part your blog. If I lived nearby, I’m sure I would take advantage of the shade and the cool breeze to gather my thoughts and to think in the serenity of this beautiful place. There isn’t anything like it anywhere near where I live, that I know of. Thank you Roko, I am very pleased that my stories and photos brought back your very special memories. What a beautiful post. I spent a day in Dubrovnik a few years ago. As you said in your post, most people miss this treasured gem. My memories of Dubrovnik are the beautiful architecture and then a very elegant late lunch in a quaint restaurant. And of course the sea. Thanks for these lovely photos. How wonderful it must be to attend a concert in this monastery. 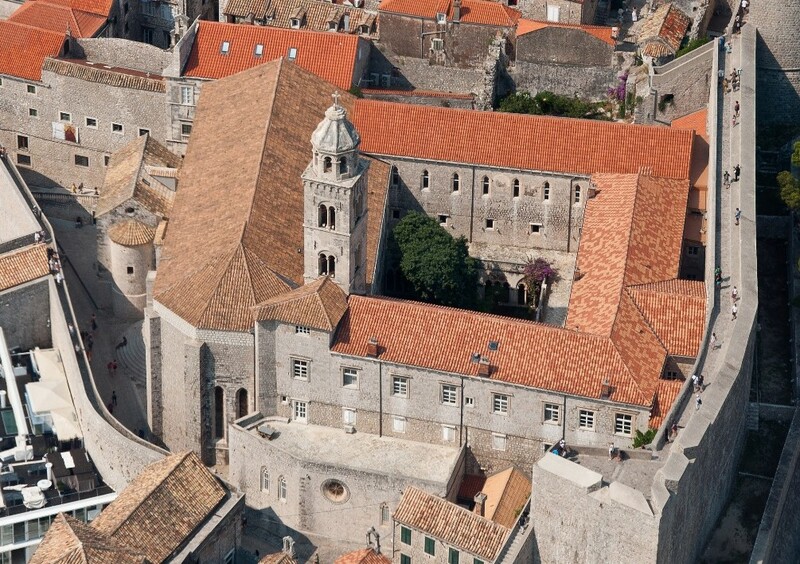 Thank you for reading my stories, they are all written as a labor of love for Dubrovnik. Perhaps you may want to return to this area again, there is so much more to discover in our small country. Wonderful Monastery, I love the old buildings and the history of such wonderful places. When ever I go abroad I always love to visit the church’s and see the magnificence of their interiors.. These have been so well preserved through the years..
Blessings for sharing.. I came via Ina’s reblog..